← Do You Live Close to Your Church? Do You Really Have Access to Heaven? 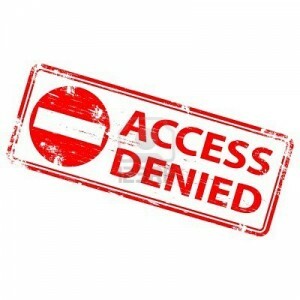 Have you ever thought about all the things we are denied access to? We are denied access behind the counter at retail stores and various shops. We are denied access to country clubs we don’t belong to. We are denied access to hotel pools we aren’t staying in. We are denied access to gyms of which we are not members. We are denied access from searching government databases and records. We are denied access from our local bank vault. We are denied access to the White House without permission. We are denied access on the personal property of others without their permission (i.e. trespassing). We are denied access to certain meeting even at our own place of work. Even with all the wonderful freedoms we have there are countless things we are denied access to every day. And here, my friend, is where we need to do some honest thinking. Do I Really Have Access to Heaven? Although we live in a world where we are denied access to so many things, we live with ironic belief that God will always allow us access into heaven. We accept and understand that we aren’t given access to country clubs and gyms, but we scoff at the idea that God would ever deny us access to His heaven. We accept when other fallen, imperfect, and sinful people deny us access to temporal things, but we decry the thought that the righteous, just, and holy God would ever deny us access to His eternal joy. So, we need to confront our ironic beliefs. We need to ask ourselves, “If I am so often denied access to unimportant, silly things by imperfect human beings, how have I grown so confident to think that the Infinite and Perfect God will allow me access to His Heaven?” If so many humans deny us access to their earthly things, why are we convinced God will allow us access to His Heaven? Thankfully, God has not locked His heaven. Although, in our sin, access to heaven is denied, God has sent Jesus to meet the requirements of heaven for us. Through Jesus, God makes us able to gain access to him. Jesus has paid for the sins that kept us out of heaven and He has lived the perfectly righteous life that gains us access into heaven. Through Jesus, God has made a way for sinful men and women to be forgiven of their sin and worthy of acceptance in heaven. The result of Jesus’ work on the cross is seen wonderfully a few chapters later in Romans. To put it simply: Through faith in Jesus, our access to heaven is granted. There is only one way to gain access into God’s heaven. Thankfully, it isn’t based on the kinds of criteria that human institutions use for special access (e.g. money, class, race, gender, position), but on one thing: faith in Jesus Christ. Praise God for sending Jesus. Through faith in Him, we have access to God’s heart and God’s heaven. Although we may still be denied to countless places here on earth, because of Jesus, we are and never will be denied access to the eternal place of God’s joy. This entry was posted in Uncategorized and tagged cross, eternal life, faith, gospel, heaven, jesus, salvation. Bookmark the permalink. 2 Responses to Do You Really Have Access to Heaven? It’s a good point, the differentiation between what humans allow us access to (not much, and it takes money and/or influence, generally) and what God is prepared to GIVE us. But we keep thinking that God is like humans, and He favors some over others because they’re more impressive — which is ironic, since He made all of us!